As a child, we were often told to come in out of the rain. In a national park, however, it’s sometimes best to stay put. Otherwise you could miss out on an experience of a lifetime. 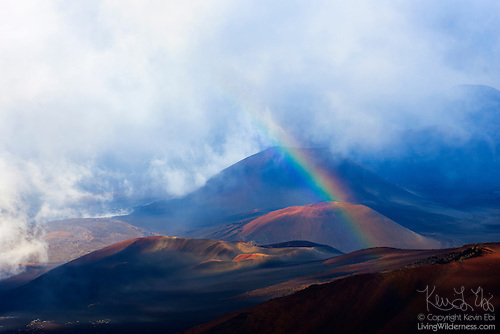 And I’m honored that one of my experiences of a lifetime — the afternoon that resulted in the image Rainbow on Haleakalā — was selected by the U.S. Postal Service to appear on a very special commemorative stamp to honor the 100th anniversary of the National Park Service. Kevin Ebi is a professional nature photographer whose work has appeared in numerous publications, including National Geographic, National Wildlife, Smithsonian, Outdoor Photographer, and Lonely Planet guides. He sells prints and calendars, and licenses images through his website at LivingWilderness.com. Become a fan on Facebook, Instagram or on Twitter. Copyright 2000-2018 Kevin Ebi/LivingWilderness.com. All rights reserved. Simple theme. Powered by Blogger.